Welcome to the web marketing module! In its simplest form, marketing is action of promoting products and services. In the past few years, businesses have realized the importance of social media and online marketing to drive users to its website and increase its patronage. While Facebook and Twitter are the most popular tools, there are many others that can be used to grow your library, connect with patrons, and market your library to a wide audience. In this module, we will cover the basics of Pinterest and Flickr and how to use them as marketing tools. Pinterest has two types of users: individuals and businesses. Individuals use Pinterest to store inspiration. Pinterest users “pin” items to digital bulletin boards which are editable and can be shared with followers and other Pinterest users. Users can browse Pinterest by predetermined categories or the search bar, allowing them to locate anything their heart desires. DIY instructions, fashion and beauty, and recipes are popular topics for females while men prefer sports, technology, and cars and motorcycle categories. In contrast, businesses use Pinterest as a way of marketing their latest products and services, as well as sharing recent news and increase website traffic (all pins are linked to their original source). With over 10 million users, Pinterest is fast becoming an excellent marketing tool as a way to reach a wide audience, particularly females, who make up approximately 60% of Pinterest users. Although the site can only be used after requesting an invitation, it’s free! Making it a cost-effective means of reaching your audience. Libraries can, and should, connect with other libraries, staff, and patrons on Pinterest. By following other libraries, you will be updated with the latest news and can compare and contrast the different offerings. Allowing staff to access boards can mean better workplace involvement. But most importantly, connecting with patrons allows for the promotion of new products, services and events. Indiana University Mauer School of Law Library has a board to advertise new ebooks. The University of Idaho has a board for its subject guides. They also have a board promoting a book discussion event. You can even have some fun, like Purchase College’s board for Quotes & Memes. These types of boards keep the public aware of what’s going on in the library without the pressure of creating a large marketing campaign. The better your boards, the more you pin… the more followers you will get! Ashland University Library has a variety of boards with interesting topics and they have more than 500 followers! And finally, one of the largest benefits of Pinterest is that once a user shares something (“pins” it to a “board”) others on the site can share it, too! This means others can re-pin items from your boards, making them seen by an even bigger audience! Optional: Watch this webcast on Pinterest for libraries to get some ideas. Brainstorm a list of possible boards that could benefit your library. Be creative! Which libraries do you think use Pinterest most effectively as a marketing tool? Read some articles to know what people are saying about Pinterest. Create a blog post on your thoughts. Do you agree? Disagree? Why? Flickr is an online photo management and sharing application. It is owned by Yahoo! and has a variety of services that accompany site membership such as applications, and website links. Flickr has over 51 million active users. How is it used? Flickr is used to store, edit, and organize photos online. Individuals use it to share photos with people around the world, while photographers use it to showcase art. Flickr allows users to organize photos in three ways: sets, collections, and galleries. Sets are similar to albums, where users organize their own photos by any topic they choose, such as ‘Vacation 1999’ or ‘High School Graduation.’ Collections simply group these sets together, usually by theme. 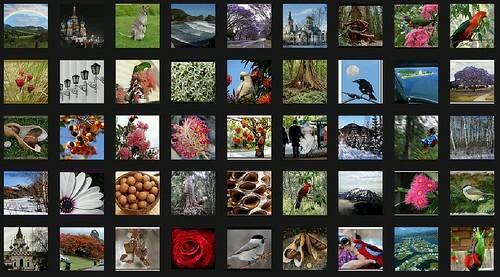 Galleries are a way for users to curate their photos combined with others, usually by theme or idea. Galleries have an 18 photo limit to mimick the job of a gallery designer. Photos can be shared across the site, as well. Through Flickr, users can form contacts, who can see each others uploads easily and share photos. Groups can also be joined or created, to connect with people with similar interests. Groups can be public or private, and members share photos and discuss images using the group forum. Photos are also searchable on Flickr on a variety of factors such as geolocation, tags, people, and description. 1) Decide how you are going to use Flickr. Many libraries use it to organize their digital collections and make them accessible online. Others use it to document library activities. Others, still, use it as a make-shift guide to the library. However you use it, consistency is key if you want to increase your number of users. 2) Make good use of tags, collections, and sets. This will make it easier for people to find you on Flickr. Make sure you appropriately describe all photos by being as accurate as possible and using terms that are likely to get you noticed. ‘Book’ for example, yields nearly 6 million results but ‘f scott fitzgerald’, on the other hand, has less than 4 thousand. Choose wisely. Bonus: Add your website to your profile and include appropriate website links to photo descriptions. Do not do this for every photo (it will bother some users) but if it is useful, it should be included. 3) Connect with those in your industry. Joining groups is a great way to stay up-to-date with industry ‘news’ and connect with other libraries and even the ALA. make sure to stay active in these groups by adding photos and participating in forums. You are more likely to be seen this way. Adding employees, patrons, and other library-related people as contacts also expands your reach and can increase use. 1. Sign up for a Flickr account. This can be done independently or through your Yahoo! account. 2. Upload photos and create a set. Be sure to add tags, people, and a description if appropriate. Learn how to properly tag your photos. Would you use Flickr in your library? How? What tools are most effective? How could you start an online marketing program with the tools you learned about this week? Optional: Add a Flickr image to your blog post.